Maybe it should have been. But Treasury secretaries have learned over the years that comments they thought were clear have not always been taken that way. More than perhaps any other official in the American government except the Federal Reserve chief, a Treasury secretary finds his remarks flyspecked to an extraordinary degree, with each word often given far more meaning than intended. Tony Fratto, who was a Treasury Department official under President George W. Bush, said that Mr. Mnuchin had just come across the same tripwire that his predecessors had stumbled over, but that it was part of learning the job. A novice in government, Mr. Mnuchin has at times projected messages that fell flat. When the first new dollar bills with his signature rolled off the presses in November, he posed with his wife, Louise Linton, holding a sheet of them in photographs widely mocked on social media for seeming to project a plutocratic image. Last month, he raised eyebrows when he said he “didn’t realize that it was the global elite” who attended the World Economic Forum in Davos. But his stock has been high lately in the Trump administration, after his success in helping to pass a $1.5 trillion tax cut package, and he has been the face of the United States here for two days leading up to Mr. Trump’s arrival. He made his dollar comment during a briefing on Wednesday with reporters who asked about the American currency. The part about “a weaker dollar is good for us,” because it makes American products more attractive in foreign markets, ricocheted around the world. 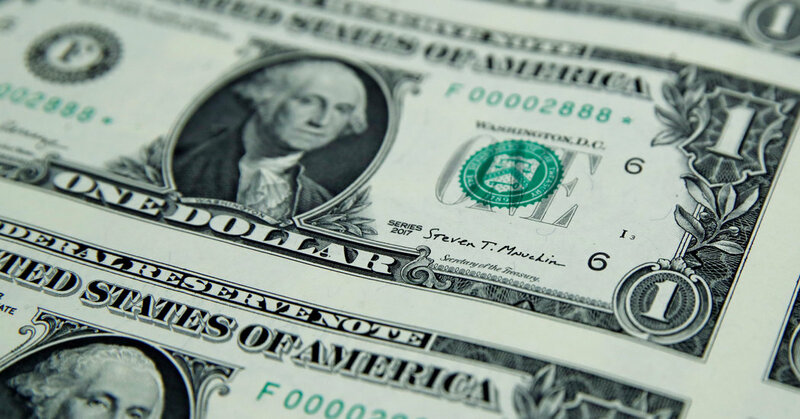 By the end of the day, the dollar index, which measures its strength against six major currencies, had fallen to its lowest point since December 2014. The president has since learned not to say such things. “Nobody should be talking about it,” Mr. Trump told CNBC on Thursday. He added that he thought Mr. Mnuchin’s comment had been “taken out of context” and that the dollar should reflect the economy. “Our country is becoming so economically strong again and strong in other ways, too, by the way, that the dollar is going to get stronger and stronger, and ultimately, I want to see a strong dollar,” Mr. Trump said. Mr. Mnuchin’s comment set off a sharp market tumble in part because it fueled an already established weakening trend for the currency. Over the last year, the dollar has declined by more than 15 percent against the euro, more than 10 percent against the pound and roughly 4 percent versus the yen. That partly reflects optimism about the improvement in those economies rather than pessimism about the United States. But the political backdrop also matters. The Trump administration’s vocal push to strengthen American exports and protect manufacturing jobs has raised uncertainty about the future direction of its international economic policy. “The context in which he made this statement is what, I think, made it reverberate in international financial markets,” said Eswar Prasad, a professor of trade policy at Cornell University. It has been standard practice since Robert Rubin was Treasury secretary under Mr. Clinton in the 1990s to officially support a strong dollar even when administrations wished otherwise. When Treasury secretaries have made comments that seemed to suggest a softening on that, markets have reacted, as they did this week. Mr. Fratto, the former Bush administration official, said that it was possible to jawbone the dollar and influence its value in either direction but that such an effect would not last long: Ultimately, currency values reflect real economic fundamentals.